Though it was released in Ireland some two years ago, Lake of Learning has only recently become available in the UK thanks to Copperplate. According to the accompanying press material this is the third album to have been released by Tim and Friends and it is a great pity that the previous two remain relatively unknown recordings (and, apologies, but this reviewer has never heard them). Let’s start with the Friends first of all since, in more than one sense, they are key figures throughout. Though Tim’s own guitar is a key and reliable element throughout (and he also adds bodhrán and bones on occasion), eight and a half of the album’s twelve tracks are instrumentals. So very much at the musical forefront are concertina player Barry Magee, fiddler Paddy Jones, accordionist Ger Culhane, and Matt Bashford who supplies uilleann pipes (including some amazing single-note squeals and wails on the title track) as well as low whistles and that well-known traditional instrument the clarinet. Anyone familiar with Ciaran Carson’s excellent little book (its dimensions never diminish its import) may recall this: ‘I have never heard Irish traditional music being played on the clarinet. I don’t know why this should be. Nor the euphonium, though I can understand why this might be.’ (Please don’t send in your recently recorded euphonium version of The Lark in the Morning, although actually, on second thoughts ....) Well, Ciaran, you’ll still be waiting for that clarinet because Matt doesn’t exactly play in a traditional style on the song Reconciliation. Maybe Desi Wilkinson’s your man! Anyway, to return to the matter in hand, more ignorance must be divulged because this increasingly uninformed reviewer has never heard of any of the musicians involved except Tim (though that’s clearly his problem and not theirs). All he can say is that they’re clearly a grand and proficient bunch and well immersed in Kerry’s musical traditions, especially the music of Sliabh Luachra (whoops, you see, there’s another lapse – I didn’t mention that TOSaF are based in the county). Indeed many of the tunes here are drawn from Kerry or a quick nip across the border into Cork, including The Humours of Lisheen, a stirring set of polkas, Cronin’s (which Barry learnt from the remarkably-named John Lucid), and slides such as Going to the Well for Water. Plus, the listener’s money will also provide access to a French-Canadian jig, Carolan’s Mr. O’Connor (played solo by Barry Magee) and a slow air, Feartha, composed by Tim himself and played with expertise on the guitar. As for the four songs, well, it has to be said that they’re rather a mixed bag. Tim is not a traditional singer in terms of either style, background or inclination (and I’m guessing at the last two terms). Like many a contemporary singer-songwriter he adopts a somewhat clipped and occasionally hurried approach to his material (and that’s not a criticism either). This works to a ‘T’ on his own Lake of Learning, by far the most confident and effective vocal performance on the album, but is sadly and erroneously applied to Willie Taylor, the only traditional song on the album. Now Willie Taylor is a truly classic song and one of the great murder ballads and is entirely unsuited to the up-tempo approach applied here. For how it might be sung harken to Cran’s Black Black Black. Lyrically, the other two songs are unquestionably awful. Reconciliation is one of the worst pieces Ron Kavana ever composed, combining cloying sentiments with that typically ‘Oirish’ corniness (the use of a music-hall song’s lines as the chorus) for which Ron has sadly become renowned. The other is Andy M. Stewart’s Freedom is Like Gold, the kind of protest song which makes this listener want to demonstrate outside Andy’s house in protest against the composition’s existence – crass, crass, crass! Sorry, Tim, but there are far better songs which you could and ought to be singing. However, despite those misgivings, Lake of Learning remains a largely enjoyable experience. 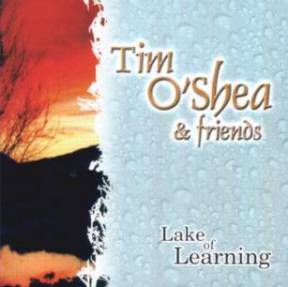 More information can be found at www.timosheaandfriends.com and the album is distributed by Copperplate in the UK.